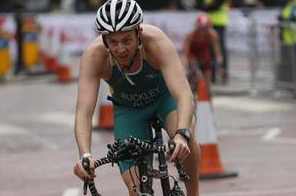 My journey to the 2013 World Triathlon London probably began a couple of hours after competing in the previous year’s event. In Auckland I had given everything (finishing 82nd in my 25-29 year age-group) I could on the day, but deep down I knew I hadn’t given the same amount of effort in preparation for the event, lacking the commitment and consistency required for success. As I stared at my 2012 race result on a noticeboard, it cut pretty deeply and I even contemplated giving away triathlon such was my disappointment with my performance. I realised I needed to change my approach and take myself out of my comfort zone. I made the tough decision to leave the triathlon club I had called home for 15 years and begin a new challenge. I was fortunate to join Steve O’Brien and the team at FUSE Multisport in November of 2012. The team was very welcoming and I quickly learnt everyone within the team has a role and responsibility to play, including preparing yourself to the best of your ability. Preparation includes getting to training on time, getting enough sleep, taking enough gels and energy drinks on rides and having your bike prepared for action. Ben Tripodi and I often joke enroute to training, that bike adjustments at 5am should be avoided as they are always stressful and never time efficient changes. The most important part of preparation however is being mentally prepared to work hard. This involves putting all of your troubles, work stresses and worries to one side to maintain your concentration and get the best out of yourself during the two hour training sessions. Steve sets high standards and expectations of professionalism and preparation within our group, he is never late to sessions, which he has always pre-planned and has set individual objectives, much to our benefit. Over the following months since joining Fuse, I used the pain and disappointment of Auckland to put in some of the highest intensity sessions I have ever performed as an athlete. At the same time my motivation, drive to succeed and love of triathlon also returned. I went to age- group qualifying races in Coomealla (NSW) and Elwood (VIC) finishing 6th and 11th respectively in my age-group. When I was selected for the Australian sprint distance team to compete in London I felt privileged, but knew the job was not even half done. I sat down with Steve and we mapped out how we would tackle the task of London. 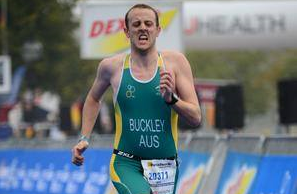 It was to be a big challenge, as the race would be held before the triathlon summer kicked off in South Australia. For the next 5 months, I worked harder than I ever have. 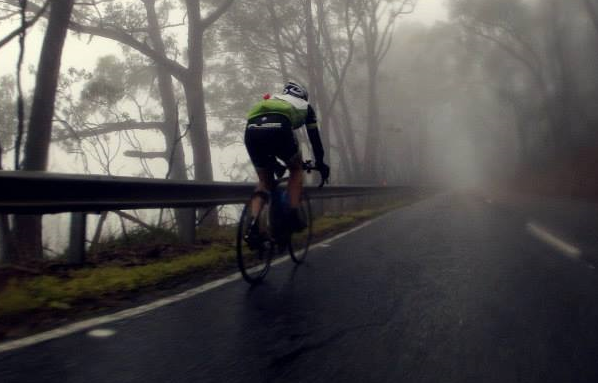 The Adelaide winter offered quite brutal conditions, a typical session may involve climbing Norton Summit in the dark, cold and mist, with nothing but your front bike light for vision and the sound of your bike working hard to get you up the hill. Running sessions in the dark and rain were also pretty common. On a few occasions when my teammates were away or injured I got up at 5am to train on my own in the dark with just Steve watching on. However, my motivation would not waver, I was going to London in the best condition possible. My teammates were also aiding my preparation selflessly; in bike sessions, Sam Tebeck and Nick McLeod would ride on my wheel and not let my concentration or speed drop for a second, while at running Ben would raise what seemed to be my maximum speed further for a sprint finish, as he gleefully egged me on. At the start of the taper, I was well and truly exhausted from the previous few months, but I felt ready and hungry to succeed further. Unfortunately, lady luck didn’t share my sentiment. I had experienced a mild head cold a few days before leaving for the UK and after boarding the plane became feverish for nearly the entirety of the long haul flight to London. I spent my first day in London bedridden (unfortunately you can’t prepare for everything). I was pleased following a consult with the team doctor, that a virus was the most likely cause and would still be able to race. Fortunately I had left some time to recover from the flight and over the next 4 days I improved very quickly. A visit to the Hyde Park course as part of my race preparation on my second day in London, felt like Christmas day as a child. The setting of the race venue was simply unbelievable. To be in the heart of London, on the previous year’s Olympic course, with the opportunity to race in front of family and friends was just amazing. Even swimming in the legendary Serpentine (lake in centre of London) held no fear for me. 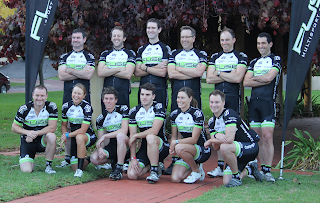 At the pre-race Australian team BBQ, former triathlon champion, Miles Stewart, inspired us and imparted how satisfying it is to put in a complete race. The feeling of satisfaction associated with knowing you had nothing left to give in a race is exhilarating and personally he valued his 6th at the Olympics much higher than a 2nd at the Commonwealth Games, for this reason. On race morning, London produced authentic English conditions, with constant drizzle and mist. As I completed my warm up and drills on my own (as previously rehearsed) I knew I couldn’t be more ready for the occasion and felt a million dollars. I was completely focused when the starter’s gun sounded with very little warning. 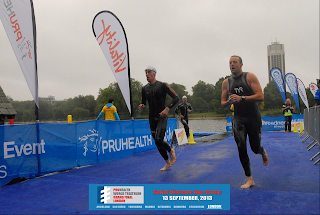 I pushed off the pontoon for the 750m swim and got a flying start. Many people had complained about the temperature of the water (around 17oC) but I didn’t really even notice it. I made it to the first buoy in about 20th position and clear of any carnage. I came around 30th out of the water (11.06mins) and was feeling pretty good as I ran to my bike. The 20km bike course, which wounded through Hyde Park, was 3 laps with some tight corners. On the advice of the Australian team mechanic, I had let a small amount of air out of my Finch tyres for the expected rain and it paid off, as many cyclists came off on the technical course. The crowd surrounding the course was roaring and drove you to ride even harder; I could still hear my family and friends screaming out for me. The racing was intense and I suggested to a Mexican athlete that maybe my back wheel wasn’t the best place to shelter from the rain. I completed the bike course and long run to transition (37 mins) and sprinted out hard onto the run course. The first 500m felt amazing, however the race soon caught up with me. The run was 2 laps of the Serpentine and was an amazing rush, retracing Erin Densham’s heroic efforts from the previous Olympics. I completed the 5km run in just over 19minutes (19.08) and was so elated to cross the finish line in 1hr 12minutes and 57th overall (7th Australian). I didn’t return home with any medals or a top 10 finish, but was very proud and satisfied with my effort, not just for the day, but for the 12 months before. Feeling satisfied after a race is a big part of the enjoyment of triathlon and not something I will forget in the future. A big thank you to everyone who helped me during this time, including my coach Steve, my training partners, friends and family and especially to my supportive and understanding wife, Lucy.